Sofia was supposed to have a swim class on Sunday at noon but the weather was great, albeit windy so we decided to ditch class and drive south to the beach instead. Isabel was adamant she didn't need her windbreaker. The fleece was more than enough she said. Well. As long as she stayed in the car or behind some kind of shelter. Down on the shore it was blowing a gale. She was more than happy to button up her jacket and the hood too. 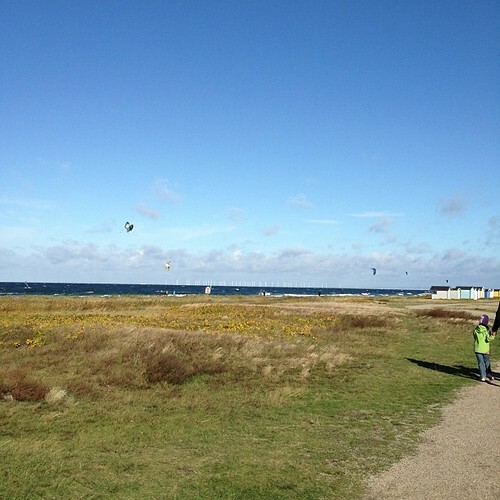 There were at least 10 kite surfers and five-ish windsurfers enjoying the winds where we took our walk. We went to Skanör which is the westernmost tip of Skåne and the place where migrating birds stop to rest before heading south across the Baltic along the Danish coast. We saw murmurations of starlings (I think), quite a few swans and several different geese ploughs. We seldom go to the beach at all and pretty much never in fall but I would like to make it a regular thing. If we go further south(east), to Falsterbo there is good opportunities to find amber washed up after the autumn storms. 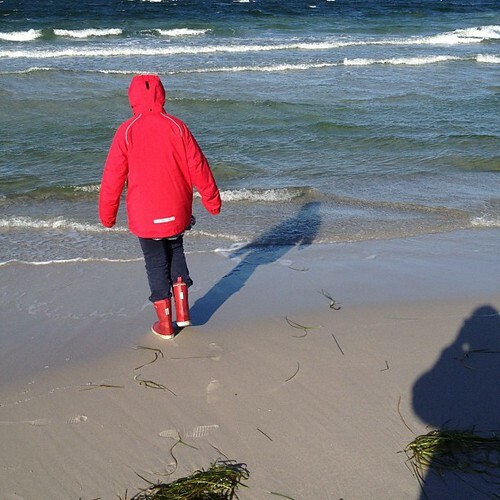 Skanör where we went yesterday is more of a sandy beach with loads of sea shells and sea weed. Further south the sand is mixed with pebbles and amber.